RAMALLAH, West Bank (Reuters) - Palestinian President Mahmoud Abbas on Monday called the U.S. ambassador to Israel a "son of a dog" because of his support for Israeli settlers in the occupied West Bank. In an angry tone, Abbas said: "The son of dog says they build on their land? He is a settler, and his family are settlers, and he is the U.S. ambassador in Tel Aviv. What should we expect from him?" Friedman, a strong supporter of Israel's settler movement, was an early and enthusiastic advocate of U.S. President Donald Trump's Dec. 6 decision to recognise Jerusalem as Israel's capital and to move the U.S. embassy there. Friedman responded during a speech in Jerusalem to a conference on combating global anti-Semitism, saying: "His response was to refer to me as son of a dog. Anti-Semitism or political discourse? Not for me to judge, I leave that all up to you." U.S. Middle East envoy Jason Greenblatt issued a statement calling Abbas' comment "highly inappropriate." He said the Palestinian leader needed "to choose between hateful rhetoric and concrete and practical efforts to improve the quality of life of his people." Trump's announcement on Jerusalem delighted the Israeli government but infuriated Palestinians, who have staged regular protests since then. Netanyahu said Trump's decisions on Jerusalem appeared to have brought Abbas to the point of making a verbal attacks on a U.S. official. "For the first time in decades, the U.S. administration has stopped spoiling the Palestinian leaders and tells them: enough is enough," Netanyahu said on Twitter. "Apparently the shock of the truth has caused them to lose it." 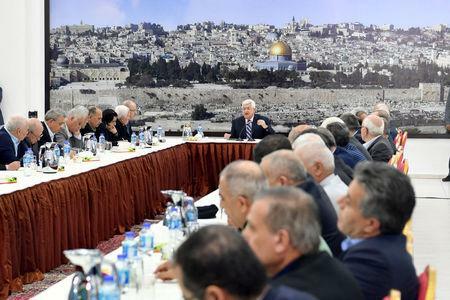 Addressing the rancour between Hamas and Fatah, Abbas said there had been "zero" progress in reconciliation, citing efforts to bring a power-sharing deal to bear on the crossings out of the Gaza Strip and on security within the enclave. Relations have grown even worse since Hamdallah and Palestinian security chief Majid Faraj's convoy was attacked by a roadside bomb in the Hamas-controlled Gaza Strip on March 13. They were uninjured. 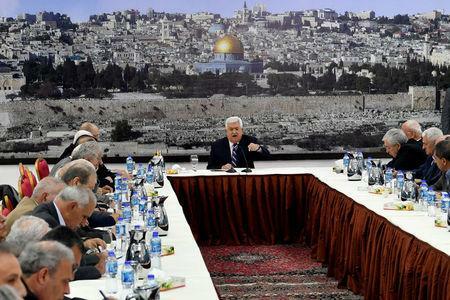 "We congratulate the two big brothers (Hamdallah and Faraj) that they are safe after the sinful and despicable attack that was carried out against them by the Hamas movement in the Gaza Strip," Abbas said. He offered no evidence of Hamas' involvement but said he did not trust Hamas to investigate the incident honestly. "We do not want investigation from them, we do not want information from them and we do not want anything from them because we know exactly that they, the Hamas movement, were the ones who committed this incident," he said. "In my capacity as the president of the Palestinian people I have tolerated much in order to regain unity and unite the homeland and I was met with rejection by Hamas and their illegitimate authority," he said. Hamas called his comments irresponsible and said they aimed to "burn bridges and reinforce divisions." The group has previously denied involvement in the bombing.